It is so great to find a new, free marketing tool in action. Congratulations to The Green Expo, who added QR Codes to their exhibitor’s fascia boards, at their event, held at Sandton Convention Centre, end September. This was a nice benefit to exhibitors, as the QR codes will generate enquiries, long after the show has closed. QR stands for ‘quick response’ allowing marketers to connect their static promotions, with a live web site. A good example is putting a giant QR Code on the side of a building, which has offices to let. A quick scan on your cell phone, would tell you the space available and the rental. It is not intended that you get one QR Code for your company, taking interested parties direct to your web site’s home page. Rather it is intended that you purchase the code generator, which is inexpensive and can make hundreds of unique QR codes for your products, services, special offers, exhibition stands, business cards etc., which will take interested parties to unique pages on your web site, or Facebook or Twitter pages. QR codes can contain over 4000 characters of data, so aren’t limited to only web site links but could contain special offers, phone numbers and e-mail addresses. It is suggested that you add QR Codes to all of your marketing material, particularly brochures and print advertising. Can you imagine adding QR codes to a products swing ticket/labeling, which would take the user to a product manual or a video on how to use/assemble the product. Wow, QR codes can create some really great marketing opportunities. QR Scanners are a free application, which all smart phone users can download. The only requirement is that your web site and marketing material, should be smart phone readable. Considering the prevalence of social media, which is mainly accessed via smart phones, many web sites are already mobi sites. Congratulations also, to The Green Expo, for chalkboard fascias (shown in top pic. ), oil-drum furniture and for putting ‘your money where your mouth is’ and donating 2 trees, per 4 m2 of stand space, to offset the show’s carbon footprint. This is a cornfield at the Kraay family farm in Alberta Canada, which measures 309,570 square feet, which is 69,000 m2 or 17 acres!!! 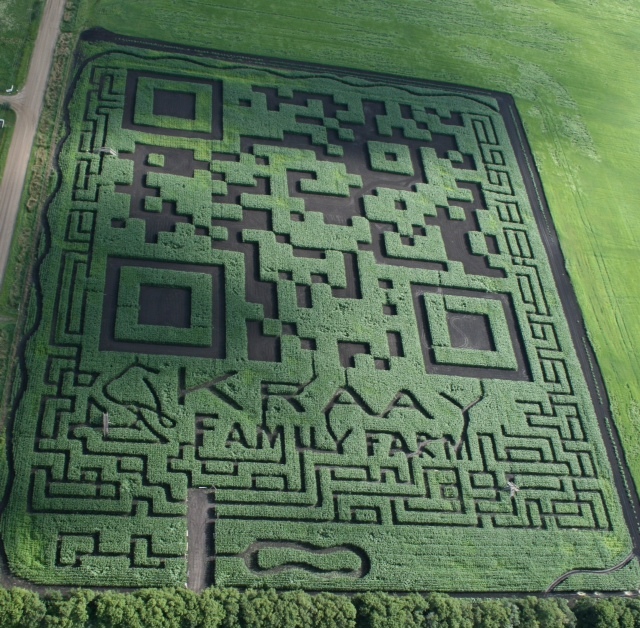 Best of all, the corn-field QR code actually works, as verified by the Kraays using a helicopter. When I said that there was no limit to the marketing applications for QR Codes, I could never have imagined this.